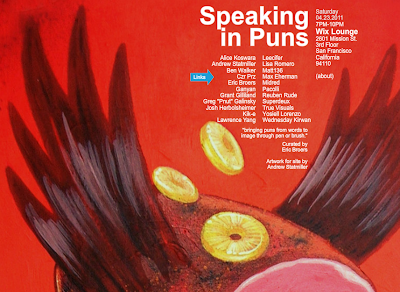 This Saturday April 23, at Wix Lounge, Speaking in Puns...an group art show all about the visual pun. Some of the worlds greatest artist will be showing there puniest of puns in the form of visual art! I went to Wix Lounge to drop off my pieces for the show and was taken away by the awesome view. Wix Lounge is located on the third floor of the US Bank building on the corner of 22nd and Mission in San Francisco. Come by Saturday evening for good times and punny pictures!! Purchase pieces from the show here.